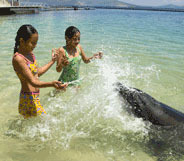 Enjoy our dolphin friends in their lovely lagoon by the rain forest. Learn about these fascinating animals, while being thrilled by their grace, agility, power, and intelligence. This presentation is packed with action, smiles, interesting information, and an important conservation message. Want an experience you’ll treasure for a lifetime? Come swim with the whales and dolphins! This 45 minute experience begins with a short presentation on marine mammals. You’ll be given a life vest and then hitch a ride with one of the whales to a floating platform in the big natural lagoon. In the deep water you’ll be joined by our animals for rides, hugs, and photos. Then it’s back to the beach for more touching and feeding and capturing great pictures. Come join the fun and make a friend for life. 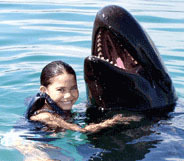 For those who want to keep their feet on the ground, experience the wonderful whales and dolphins in the shallow water. Your 30-minute adventure begins with a short presentation on marine mammals, then meet these friendly animals eye-to-eye, hand-to-fin, and foot-to-fluke. Touch, feed, and hug your newfound friends. You'll even participate in a demonstration of their sonar ability. Lots of great photo opportunities to keep the memories alive. Reserve your spot today. 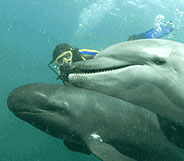 Join the whales and dolphins for a special, intimate, underwater experience you will never forget. Your adventure starts with a personalized presentation on the individual animals you will be meeting. Then its into the lagoon for this 30 minute interaction. Explore the underwater world of whales and dolphins, and experience how gentle and playful they truly are. When you resurface, get one final hug captured on film for a lasting memory. There is no other program like this in the world. So make your reservations today. You must be a certified diver and have your dive certification card with you. 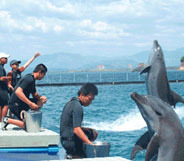 Be a marine mammal trainer? What are the skills you need to become a good animal trainer? You must be a good teacher, because training is teaching. You must be a good student, since there’s much you can learn from the animals. You must be patient, consistent, creative, and flexible. You must develop a bond with each animal based on trust. And most of all, you must love what you do and never stop growing.